If you have a precision rifle ( bolt or semi auto) you are proud of and would like to share, here's a place to post it up. Tell us about it, got some cool pics of it? Let's see those as well. 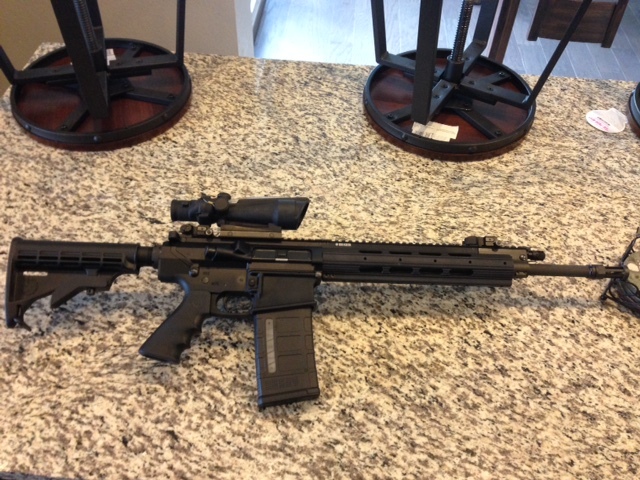 Purchased the Ruger precision rifle in 6.5 creedmoor a couple weeks ago. No pics yet as I have not shot it or anything yet other than un-box it and make it cozy in the safe awaiting optics. (Ordered a vortex razor hd gen2 4.5-27x56mm mrad today). Still need to figure out ring height and decide which rings to go with. I got into PRs about 10 years ago. It started with a bone stock Remy700 Sendero II with fluted barrel in 300WM. I had a hard time getting decent groups and bought a jewel trigger and had a muzzle brake added. Then started handloading. Got a consistent 3/4 MOA gun out of it. After taking some training classes, I began to see all the options out there and researched builders and settled on GA Precision out of KC MO. remy 700 action: Push button side bolt release. Blue printed with Badger Ordinance bolt knob. Bartlien 1:11 twist heavy barrel. 19.5 inches, threaded for a can with knurled threaded protector. McMillian A5 stock with manual cheek rest and multiple flush cup sling mounts. 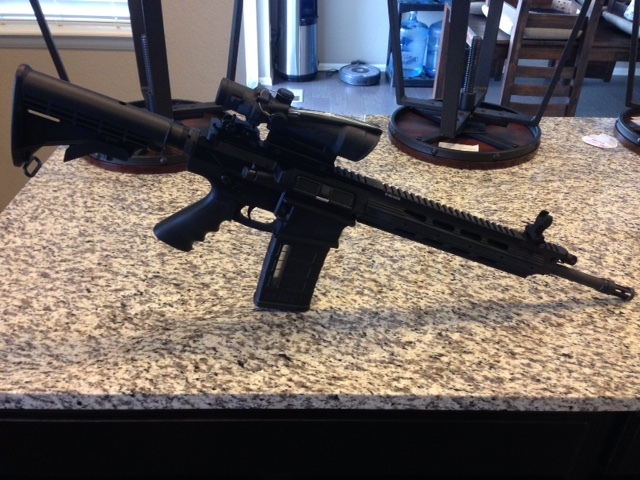 Later I added an Atlas bipod and rail under the front. Had it cerakoted in solid tan. Added a TAB Gear sling (if you want to shoot well in positions other than prone, a good sling is a must. They are also very personal so you have to try different ones and practice with them) the TAB has a bicep loop that helps get a good solid triangle with you and your weapon for steadier kneeling or standing unsupported shots. Thunderbeast Arms 30-P1 titanium suppressor. With this combination I can shoot 1/4 groups (five in a dime) at 100 and have made hits at 1000 with it although it's stretching it a bit given the BC of the Lapua round and the shorter barrel. It makes for a very handy rifle (if you can call a 14 pound rifle "handy") due to the shorter barrel and other than a GA Precision AR-10, I don't know that I would want to shoot anything else from 700M and in. I also knew you'd be sharing in this thread soon. Very nice. Like the mag upgrade (have it for my dads old 700) but plane to keep it stock from there. The can is in essence, according to the BATFE a firearm in iteself. You can put it on what ever weapon you want. You have a tax stamp for it. I shoot it all day long wihout hearing protection and the reduced recoil makes its felt recoil less than a AR-15. My next can will be the 338BA by Thunderbeast, which is a .338 can with a large volume and quick connect. I plan to run it on my 300WM and be able to switch it to the AR-10 as well. You can use a larger can on a smaller weapon easily. The optimal is a ID of the can that matches the round, but smaller rounds through it will function about 90% as efficient. So the 300WM through the 338 can is the best of both worlds. I can shoot that and later move up to a 338 Lapua if I desire. Oh, JR. One more thing about the can.. I'm hurt that you would think a site Moderator of my caliber (see what I did there) and someone possessing high moral character would stoop to such unscrupulous actions. Is Dr.Austria related to Dr.Pepper? Thx, I know the can gets hot. Ours were attached to the weapon. Never had my own much less allowed in this state. Yeah. Sorry about commifornia. You should come to Texas! Bobby thanks for being a good sport. Nate. Clean up on isle five ! I would think this post would have a few more gun photos then just one. By now being three days old. 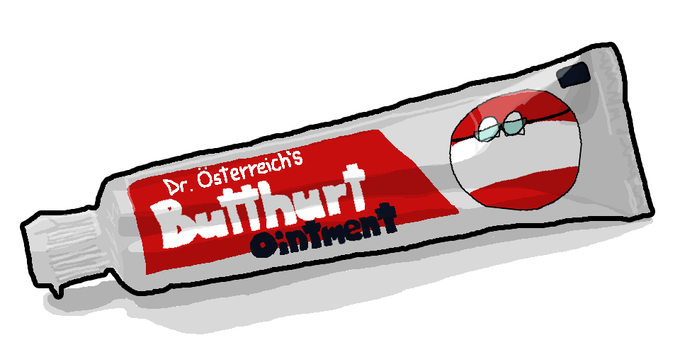 Lol it's the interwebz, you can't be offended. Redneck is making us wait. Well Chief can throw his M1A in here, Shawn can throw his 308 he built and the SR25 in here.. cough, hint, cough. Do you think they have the b****? Who is this person you speak of? ??? I told ya I'll get you some, patience Bobby! The home brew needs floating hand guard reattached never did it after installing the adjustable gas block as you can't dial it in with hand guard on. But all this chatter has peaked my interest. I think I'm gonna push up a berm of dirs. about 100 meters from the hilltop where my picnic table is, and maybe find out. Ok it's precisionish.. Still counts. I'll count that as expert testimony! 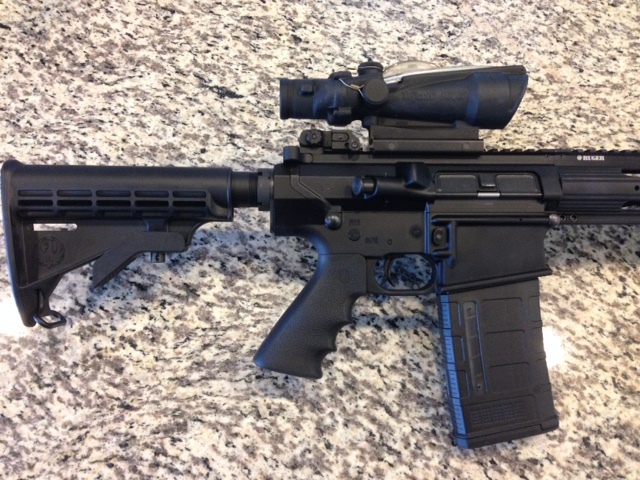 It'd probably do better if you put swapped scopes with the 300 WM or the 264. Here you go with better optics and a better shooter this may fall in this category. 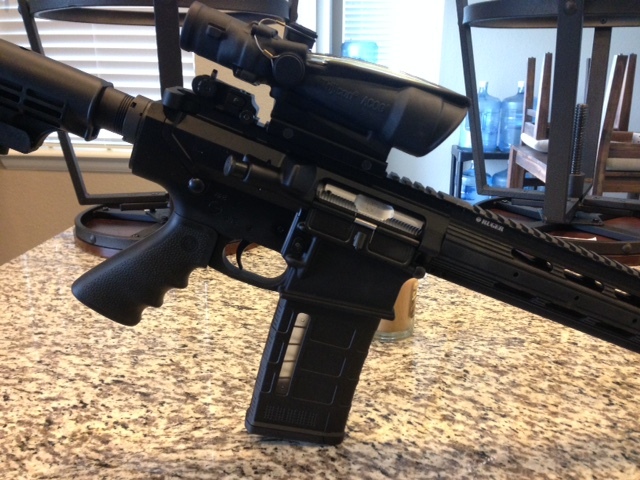 Ruger SR25 with Acog 3.5 x 35, bone stock and only mod I plan on performing is ambidextrous safety as I'm a lefty. May swap flash hider if I buy a can down the road at some point. Well the rail for the SR-25 alone costs...... rounded to the nearest even dollar amount.... $700. Well, that's just silly then. I think the rail for the one I built was a 1/3rd of that. Probably reason I didn't buy that gun & ended up with what I have. Yea expensive is very true. Shawn, i think what Bobby is sayin' is that you aren't good enough for this thread. He's kinda picky like that. ...serious question tho, is your's a 7.62 ? Shenanigans. I know he has another 308 that's more precision. I've been hinting I wanted to see the SR25. Although I can start another thread for "Battle rifle" type stuff. We definately should have a "show off your -----" threads for the different types, like ARs, Mils, etc. or maybe we do already. hmm, I'll have to look. Well, I volunteer to start the thread "Show off your dog, ya know the one you'd like to give away!" Yes, 7.62x51 came with nice soft case & 1 ten round mag & 3 twenty rounders all magpul I added several 25 rounders to my collection. Bobby, not really. I'm not a precision shooter by any definition of the word. The other 308 I have is built off the same receiver design as the SR25 actually bought it from the machine shop that builds them for ruger. I lived in Indiana all my life, if you had 400 yards open to shoot that was a very long shot. Here in Colorado it's a bit different & I may take some lessons or build my collection accordingly now. The most precision rifles I own are most likely my 30-06 & 22-250 in a 700 flavor but again they aren't anything special. I tried posting this earlier on the web from my phone but the pix ,I guess, were to big. Here it goes on tap talk. Bone stock Rem 700 police, except for the Kydex adjustable cheek rest. 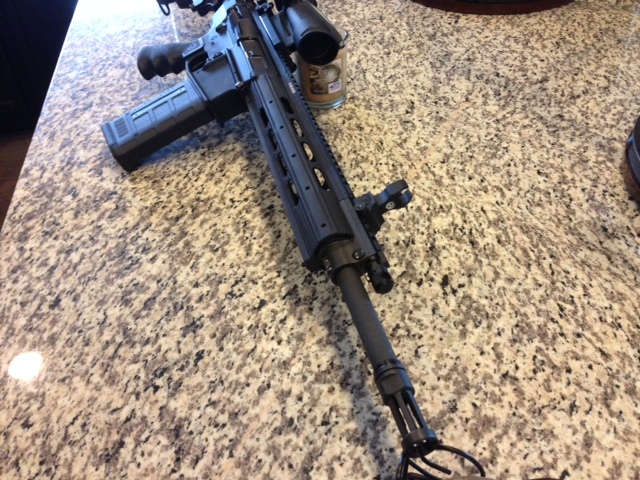 26" Heavy barrel, stock trigger except I adjusted it down to about 1.5 lbs, Harris bipod, Barska 10-40x50 with illuminated retical, the glass is mounted with 30mm Burris Signature Series with adjustable MOA inserts with dove tail mount to Burris two piece base with adjustable windage. Ammo that day, factory Federal GMM 175gr SMK HPBT 2650 fps on the box. Not a bad group for stock stick, inexpensive glass and factory ammo. I did chronograph after shooting the group to get a 5 shot average. There are a few more upgrades for would like to add and really thinking about reloading to develop a more consistent round for this and bulk ammo. Is that a 308 Keith? nice gun and nice group. Yes it is and thanks. I think my next one will be .338 LM. Just not sure what model yet. Keith, that's great shooting! Marines teach you that or is that just instinctive? A little of both and Alot of snap in time. Scout snipers were attached to our unit in the Med and Hati. Became good friends and did some cross training with them. Also my MOS was 0352 anti tank missile, TOW2. Tank sniper. Longest shot 3250 meters. I did some time in the front seat of a Cobra AH-1S a long, long time ago in a galaxy far, far away. But I still remember the max effective range of that TOW missile...3750 meters! So 3250 is a pretty sporty shot there my friend! I can't make the claim that this is a precision rifle, but it shoots well. I sat in the front seat of a super cobra on ship off the coast of Hati but they wouldn't take me up... You know that whole your "enlisted and only officers can ride" thing. Yes, the M.E.R. is 3750. I've also seen them come out of the tube and go vertical when one of the wires snapped. Man you got ripped off, we would take enlisted guys in the front seat all the time. Right of passage for a crew chief to fly his own Cobra! Better yet...We let our Chinook flight engineers climb into the front and fly for awhile sometimes. Me and Bob-Dawg are flying back to Ft Campbell, KY from 29 palms (California). Bob says he needs to take a break, so he hops out to go to the back of the aircraft where we have a relief tube. While he is gone, Trigger, our crew-chief climbs in the left seat. I hand him the controls and he starts flying. We are somewhere over Oklahoma and it's just maintaining 500 feet and drill a big long hole in the sky. So after like 30 minutes or more, Bob Dawg has not returned, so I ask Manny, the flight engineer what's up with the Dawg. He says, "Sir, he's sleeping back here!" SLEEPING! He's sleeping! Well I thought about it for a moment...Trigger was doing a great job flying so I called Manny up front and told him to jump in my seat, I had to take a leak as well. He does the, "Err, sir, can we do that" routine and I assure him its gonna be ah-ight! So I climb out, and he climbs in. At this point, of course, there are no pilots flying, just the crew dogs. I hung around the companionway just behind the seats and watched. Trigger was doing a good job flying while Manny had the map up and was tracing along with his finger. Looking more closely, I observed his finger was about a hundred miles from where we were, but who cares, it was uncontrolled airspace. So I go relieve myself then made my way up front where Bob Dawg was completely crashed out leaning back against one of the fuel tanks. The crew guys hadn't drawn all over his face yet with magic marker as is the custom if you EVER fall asleep onboard an Army aircraft, so I sat on the floor opposite him and laid my head back like I was asleep too! I kicked his boot and pretended to be asleep. I watched Bob Dawg sit upright, look across at me then lay his head back. Then suddenly he jolted upright and looked at me, then toward the front. That was priceless! He probably thought no one was up in the front! Remington 700 BDL in .300 Win Mag with a German something or another scope on it. Or is this my .264 mag??? I have spent plenty of time in the CH-53's and CH-47's and hanging from them, (spy rigging) repelling and fast roping. I have flown a Cessna 172 when I was contemplating getting my PPL. But I have always loved the helo's.